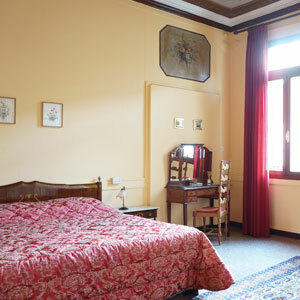 The Sister's Room has two tall windows that overlook a quiet private Venetian courtyard. 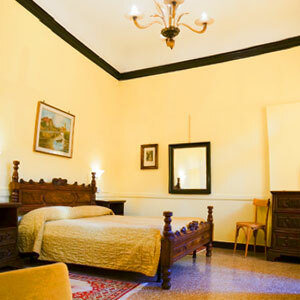 The room features a Double Queen antique wood bed, with 12 foot Venetian fresco painted ceiling, original Venetian Terrazzo Floor, antique desk and dresser along with an armoire. 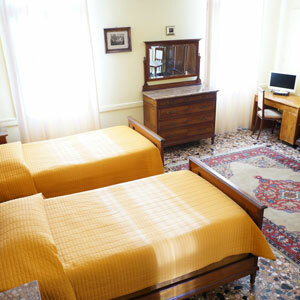 Free WiFi is available in the room. The private non-shared bathroom features a walk-in shower, sink, cabinet, WC, and bidet as well as a radiator heater for winter months. Fresh towels and trash removal every two days or on request.